$1 per Page or $25/year or $100 for 5 years ($20/yr). NOTE: In the case above it is a picture file but it could just as easily be a word doc a pdf or even an audio file. Limit audio files to one minute please as the primary purpose here is anouncements and document sharing. Allow 1-2 days processing after payment has been received. 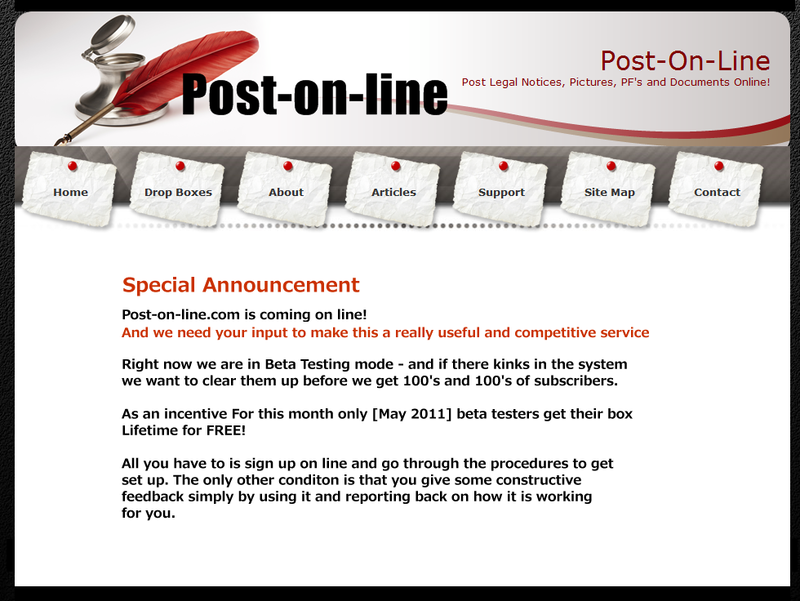 A cost effective alternative to above is to get your own POST ON LINE mail box with your own unique username and password which will allow you to share documents with people from your own box here . Storage capacity can be increased by 100 megs for $5 or $1000 megs for $18. Note your paypal invoice will be from VISIONTOWEALTH and if you use the $20/$25 option this will reference the Copyright-name.com or Post-on-line.com site.